How peace has been made and maintained, experienced and imagined is not only a matter of historical interest, but also of pressing concern. Peace: A World History is the first study to explore the full spectrum of peace and peacemaking from prehistoric to contemporary times in a single volume aimed at improving their prospects. By focusing on key periods, events, people, ideas and texts, Antony Adolf shows how the inspiring possibilities and pragmatic limits of peace and peacemaking were shaped by their cultural contexts and, in turn, shaped local and global histories. Diplomatic, pacifist, legal, transformative non-violent and anti-war movements are just a few prominent examples. This book is essential reading for students, scholars, policy-shapers, activists and general readers involved with how present forms of peace and peacemaking have been influenced by those of the past, and how future forms can benefit by taking these into account. Antony Adolf is an independent scholar. Introduction: How Does Peace Have a World History? Chapter One: Survival of the Peaceful: Prehistory to the First Civilizations. Peace, Peacemaking and the First Civilizations. Chapter Two: Peace in the Ancient West: Egypt, Greece and Rome. A Tale of Two Worlds: Peace and Peacemaking in Ancient Egypt. Ancient Greece, Cradle of Western Peace and Peacemaking? One Empire, One Peace: The Rise of Rome to the Pax Romana's Decline. Chapter Three: Peace in the Ancient East: India, China and Japan. The Many, the Few, the One: Peace and Peacemaking in Ancient India. Harmonies and Antinomies of Ancient China. Foreign Influences and Native Peace in Japanese History. Chapter Four: Monotheistic Peaces: Judaism, Christianity and Islam. Shalom: Peace in the Torah and its Times. "Our" Universal Peace: From Christ to Constantine. A Pillar of Peace: The Qur'an and its World. Chapter Five: Medieval, Renaissance and Reformation Peaces. A Tale of Two Cities: Medieval Peace and Peacemaking. (Re)Births of Peace: Renaissance Revivals of and Departures from Traditions. Reforming Christian Peace and Peacemaking. Chapter Six: Peace, Peacemaking and the Ascent of Nation-States. Peace and Peacemaking Despite Nation-States. Chapter Seven: Colonial and Imperial Peace and Peacemaking. Peaces of the World: Colonial Peace and Peacemaking. The World in Peaces: Imperial Peace and Peacemaking. Chapter Eight: Modern Economics of Peace and Peacemaking. Capitalism: The Profitability of Peace and the Cost of War. Who Owns Peace? Socialist Perspectives. Chapter Nine: Peace in the Twentieth Century, Part One: 1900-1949. The "War to End all Wars". The Peace to End all Peace? Chapter Ten: Peace in the Twentieth Century, Part Two: 1949-1989. Chapter Eleven: The Presents of Peace. Globalization: Peace at the End of History. Threatening Opportunities: Terrorism, Technology, New Media and Peace. Conclusion: The Pyramid of Peace: Past, Present and Future. "A presentation of the topic of peace with such a vast scope is deeply fascinating." "An insightful narrative history of peace and peacemaking, which is a useful resource for anyone attempting to understand how current peace principles and infrastructure developed, and how they can be strengthened to further the goal of world peace." "In Peace: A World History, Antony Adolf seeks to provide an extensive history of peace ... An ambitious project covering much historical and geographical ground, the volume includes discussion of conceptions of peace within Judaism, Christianity and Islam and within the Indian and Chinese traditions; the pacifist movements of the twentieth century; and the contemporary quest for peace in a post-Cold War world. Adolf's stimulating and informative analysis elegantly situates efforts to promote peaceful relations among states within the larger context of the intellectual history of peace as a concept, and his efforts to synthesize the various forms of peace into a comprehensive construct provide an original and clear conclusion to the volume." "Historians and political scientists seem to gravitate perpetually toward the study of war, but the study of peace could be much more valuable to the future of humanity. Peace is a notable effort to correct this problem." "A useful book filled with insights and citations from a wide range of peace philosophers and advocates. The author has managed to survey practically the entire world historical experience of peace theory and practice in a single volume ... Among the valuable contributions are: a review of findings from primatology and evolutionary science on the instinctual and behavioral foundations of human cooperation, and surveys of historical settings that have received less attention from previous peace scholars." "The diverse ways in which humans have sought to create peaceful societies are beautifully encapsulated by Adolf ... This perspective gives cause for optimism, and Adolf’s book is indeed an optimistic one. The detailed exploration of expressions of peace will be useful to all of us who strive toward making our world more peaceful." 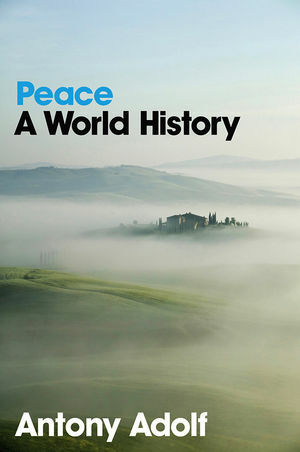 "Peace: A World History is broad and comprehensive in its scope, not only temporally but also substantively, examining both historical efforts to make and sustain peace, and the relevant literature analyzing and envisaging peace ... a valuable reference point for students, scholars and general readers of peace." "A work of considerable ability in its exploration of peace, peace mechanisms and peacemaking across the millennia ... a very valuable source of information and understanding for those who seek to know more about peace and peace making through the ages." "Adolf has made a considerable contribution by focusing on peacemaking strategies, showing that these are basic human instincts and activities, and that they must be continually exercised to ensure our suvival." "I, for one, feel greatly enriched for having taken this particular 'history course' ... the journey through Peace becomes more enlightening with each new chapter." "Essential reading for anyone concerned with the promotion of peace, the study of peace, and the making of peace. Antony Adolf's writing is articulate and accomplished. The very reading of the book is satisfying in itself." "A unique study that looks at a vast amount of history from the point of view of peacemaking." "In an unbiased historical context and accessible discourse, Adolf's analysis steadily makes a case not only for peace being an imperative for mankind's survival, but one achievable through dedication and a now well-lit precedent." "Adolf contributes to peacemaking in the tradition he attributes to Jean Baptiste Say: the scientific method ... he facilitates 'evaluations and continual improvements of policies and their implementations' that can assist the attainment of world peace." "What is striking in his approach is a far more subtle understanding of peace than many other authors have. Peace is not simply the absence of war (or strict pacifism) but the establishment of conditions for peaceful coexistence. The result, though not overlooking classical peace movements, is an attempt to show how conditions for peace can be generated through domestic and international law, through mediation and conflict resolution, as well as through processes that try to promote alternatives to war." "Recommended. Adolf explores possibilities of rational and realistic peace throughout a five-millennium history using examples from crucial time periods, places, people, and writings. Balancing a broad scope with succinct details, the author presents peacemaking in cultural contexts of religions, social structures, economics, politics, and philosophies while challenging the idea that peace is exclusively the absence of war." "The reader of this book will be impressed by the abundance of information but also by the capacity of the author to realise an objective analysis of the historical events and figures." "Adolf is to be commended for writing a unique study that looks at a vast amount of history from the point of view of peacemaking. There is a need for such ethically centered studies that address the big picture. Others of like mind will surely build on this study." "An ambitious book which spans a wide range of time and place, from prehistory to the present." "In Peace: A World History, Antony Adolf admirably demonstrates that peacemaking has not been a peripheral pursuit in human history. Adolf's work ably synthesizes the growing literature in peace history while offering its own interpretive contribution. It offers a viable alternative reading of history that locates peacemaking as a concept at the heart of the ideas and events that have shaped the world." "A naive peace is inevitably the peace of the grave. A rational peace begins when we learn collectively how to live well within the limits of our circumstances; it is the peace of preservation and renewal. Adolf's Peace: A World History shifts the focus of history from the necessities of war to the imperatives of peace and, in doing so, provides invaluable insights for comprehending the dynamic principles of future peaces." The first study to explore the full spectrum of peace and peacemaking from our evolutionary origins to contemporary times. Examples include diplomatic, pacifist, non-violent, disarmament and anti-war movements, from across the globe. The diversity of peace and peacemaking presented challenges the notions that peace is solely the absence of war. Can also be read as an “alternative” history – one which focuses on peace through the ages rather than war.